Alan & Rita had a few days holiday, and with local thunderstorms no work done last week. 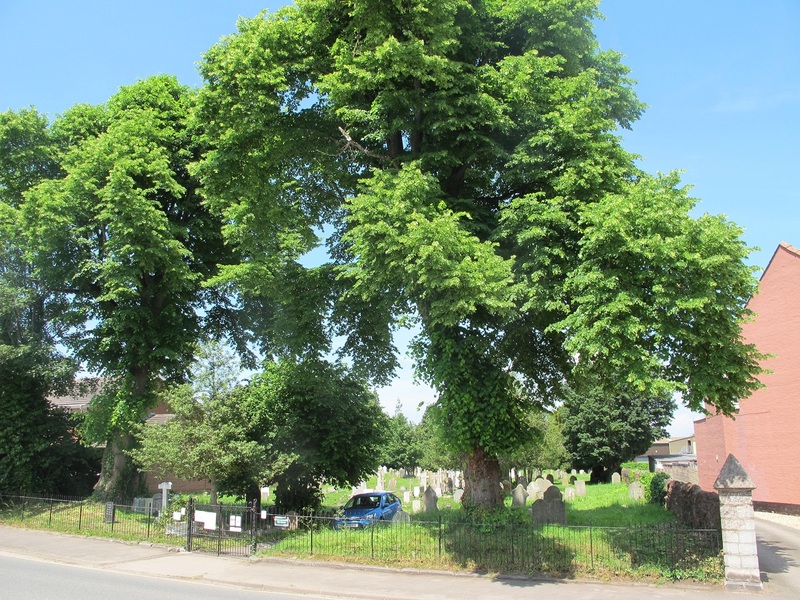 Another very hot sunny day with no rain forecast, the Friends, Alan, Rita, Andy, Dave, Kev, and Astrid, were joined in the cemetery today by the Sedgemoor Conservationists organised by Norman Lees. The Friends chairman, Dr Miles Kerr-Peterson who was visiting Somerset from Scotland to give a talk in Aller on the Wembdon Road Cemetery, with the donation and fees from this donated to the Friends. Miles popped into the cemetery for a chat to see what work the Friends have undertaken since his last visit, he could not stay long as he had to catch a flight home, but it was nice to see him. Norman brought in seven helpers from S.C. volunteers and with the group of Friends we made up a good working party. It was agreed that tidying up the front of the cemetery would be a priority, this entailed taking ivy off the wall and front pillar, cutting back the hedge that was protruding through the front fence, cutting the saplings off the two main trees and cutting back the hedge that bordered the neighbours fence. One group was given this task, an excellent job completed. A second group concentrated on the new hedge area planted two years ago. This is a big job as the hedge had to be clipped to encourage it to spread. 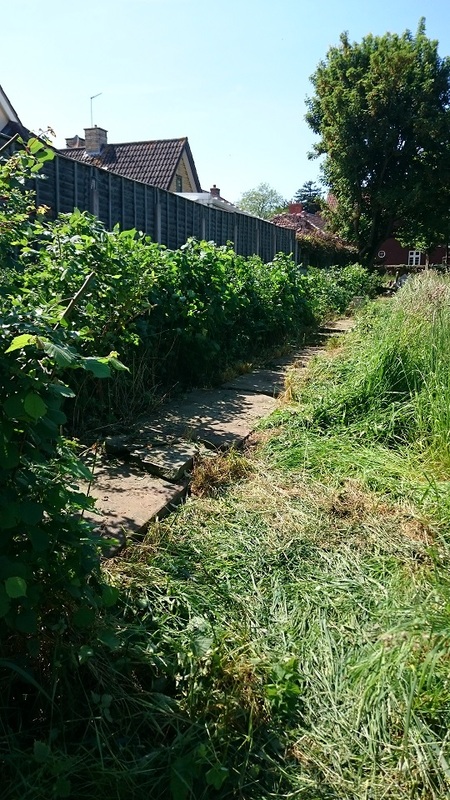 The Friends had laid a row of old headstones (dumped many years ago) in a line in front of the hedge, the hedge area and the path of headstones had become badly overgrown. 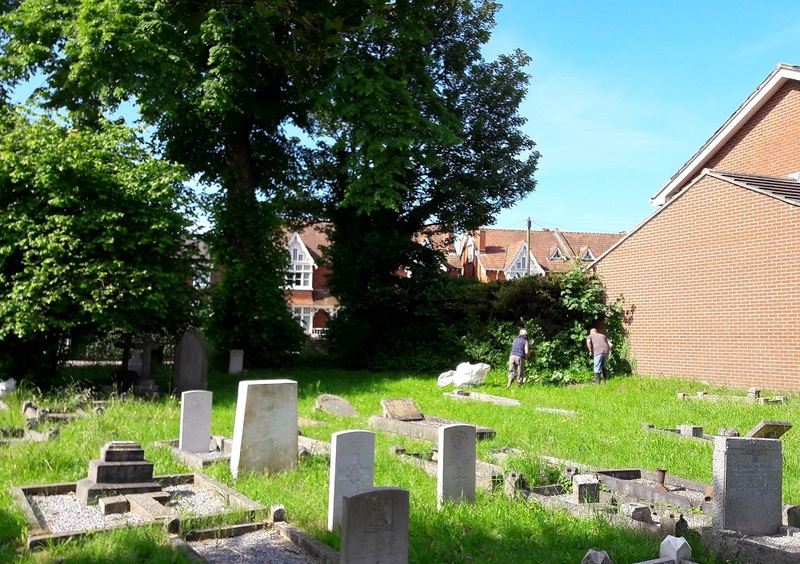 An excellent job was done, the hedge was trimmed, and the weeds cleared between the hedge and the neighbours fence, there is a bit more work needed to clear the nettles and weeds in front of the headstones. 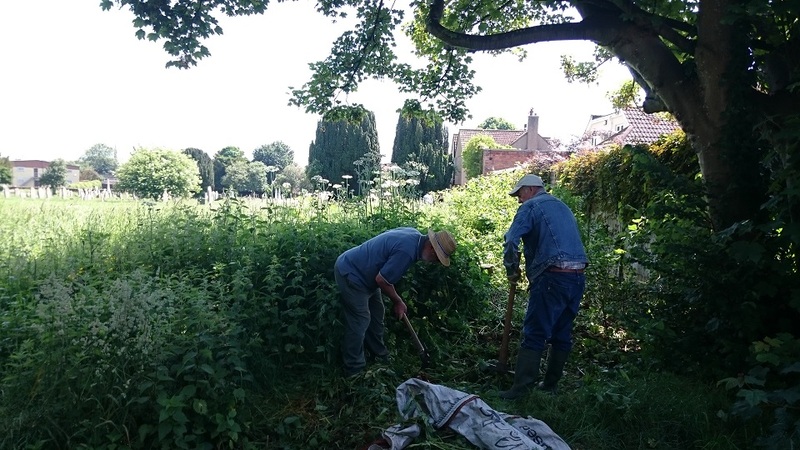 In addition, Bill of the volunteers with his brush cutter, worked marvels working in all areas of the cemetery cutting back saplings, hedges, brambles and undergrowth saving the Friends many days work. Two other members spent the day painstakingly taking ivy of the Pantomime wall. The Friends are very grateful to Norman and his volunteers for all their assistance and efforts as 12 large dumpy bags full to the top with hedge and tree trimmings, weeds, nettles and grass will testify. An email of thanks was sent to the secretary Norman Lees, of the Sedgemoor Conservationists Volunteers. Lovely sunny day, Alan, Rita and Andy in the cemetery today. The first job was to walk around the cemetery to see what cuttings etc. need to picked up following Bill's efforts with his brush cutter on Sunday, it is estimated that it will fill a number of large dump bags. 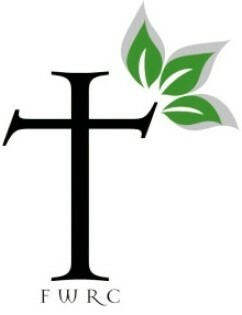 It was agreed that the work today would be centred on the Norris B69 and the Rich B61 graves. The end kerb on the Norris grave had to be moved to enable Fine Memorial to restore the Major memorial B62, the grave was cleaned of weeds and the kerb was cemented back in position. The Rich memorial is a double grave, with polished stone kerbs, with three large tier stones with a big cross, unfortunately the cross has been laid down, the three tier stones had sunk one side, and the concrete slab covering the grave had also sunk and was badly cracked. When erected this must have been a very impressive family memorial for John and Louisa Rich. To improve the appearance the first job was to lever up and pack the tier stones level, this went easier than expected and certainly improved the appearance, parts of the broken concrete slab were levered and packed up and the cracks filled with cement. It was too sunny to take photo so Andy will take one later, after the rest of the weeds around the grave have been removed. Two visitors today, Tina the dog warden came in to see us, and a gentleman came in looking for his grandfather's grave. Particulars were taken and Rita will get back to him with any information found. Alan, Astrid, Rita and Dave in the cemetery today. Alan and Dave worked on the Goldie grave B60 which had become overgrown and the kerbs broken. The weeds cleared and the fallen broken kerbs were dug out. One side of the large kerbs had been broken into four sections, these were laid in and cemented together, the end kerb dug up and placed in position. Sadly half of the kerb on the other side was missing, but the remaining piece was cemented back into position. The large stone cross is laid down in the centre of the grave. Alan & Dave then moved to the Rookley grave nearby B68 where the 9 inch high polished marble kerbs had fallen inwards. 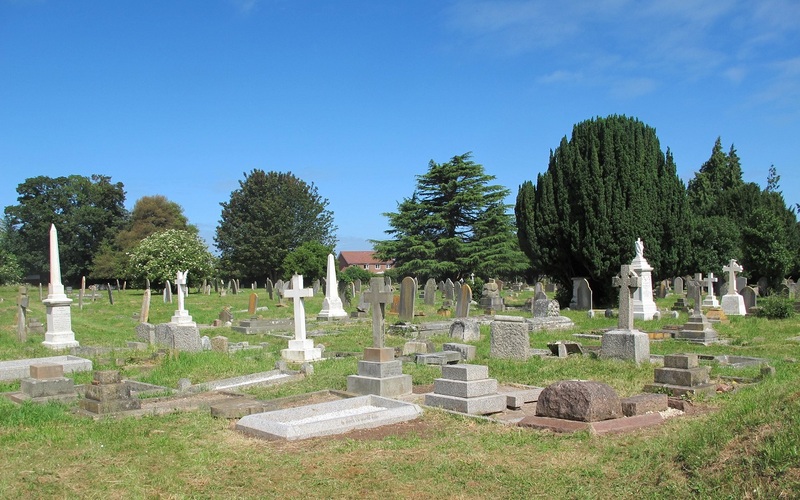 First, they cleared the weeds from the centre of the grave and levelled the area, the kerbs lifted back into position. 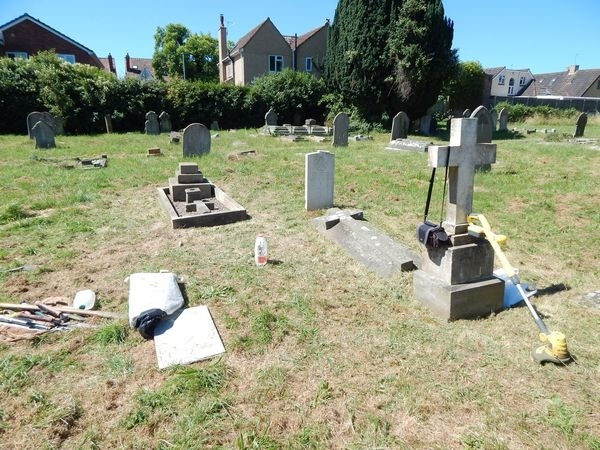 More work needs to be done on this grave to cement the kerbs back together, the centre of the grave needs to be back filled with earth, black membrane laid down and stone chipping added. 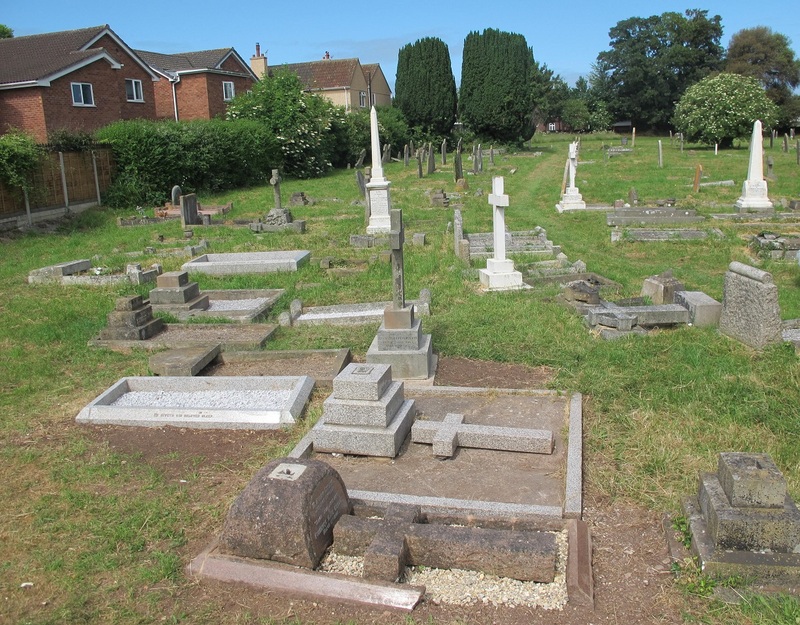 Work on these two graves have made the area look nice and tidy, a great improvement. While the boys had been working hard so had the girls. 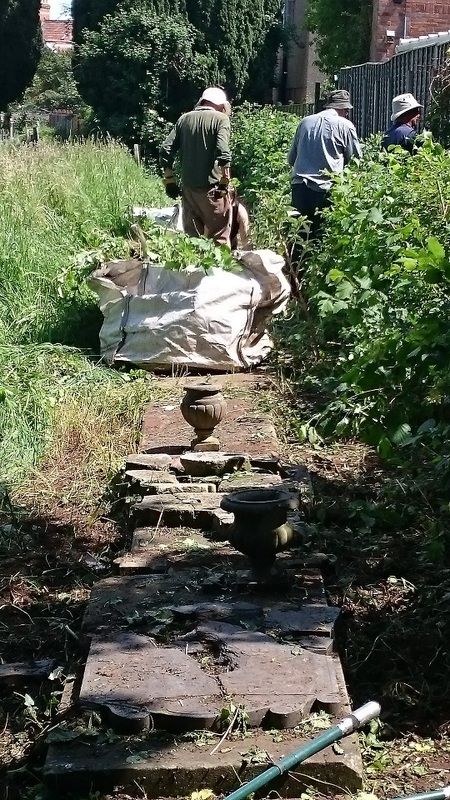 Their task was to pick up all the debris around the edge of the cemetery where Bill of the SCV had used his brush cutter to trim the saplings and hedges. They managed to fill 2 1/2 large dumpy bags but only managed to get half way round: more work to be done. SDC have been in and cut the grass again. It was noticed that the Jones grave B11 along the main pathway had been damaged and the kerb broken in two. Alan repaired this before he left for home. 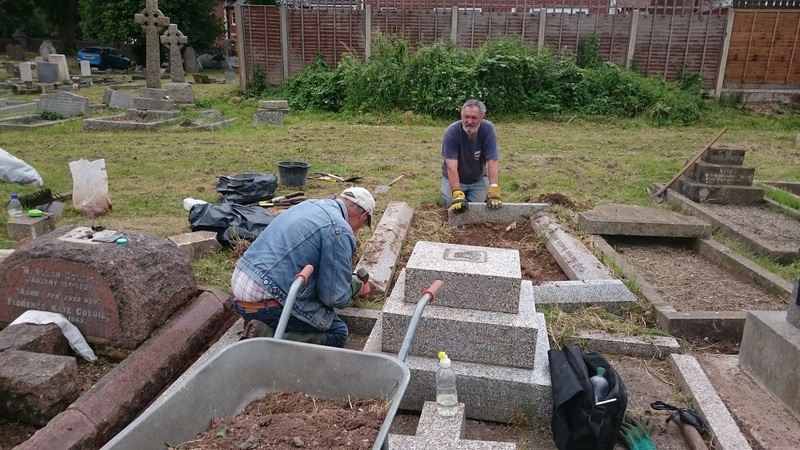 Alan and Andy went in the cemetery today to finish off the Rookley B68 grave that was started on Sunday. The kerbs were cemented back into position and the centre back filled with several barrows of earth, black membrane laid and filled with stone chipping. Satisfied with their work for the morning they packed up and headed for home. Alan, Andy and Dave working today. The weather was overcast and threatening with rain but luckily it did not materialise. First job was to tackle to Fletcher B63 grave. The granite kerbstones are all in position but the centre of the grave was overgrown with grass and weeds and had sunk badly. The weeds were dug out, the grave back filled with stone and slabs, topped with two barrow loads of earth and black membrane laid down in readiness for stone chipping. 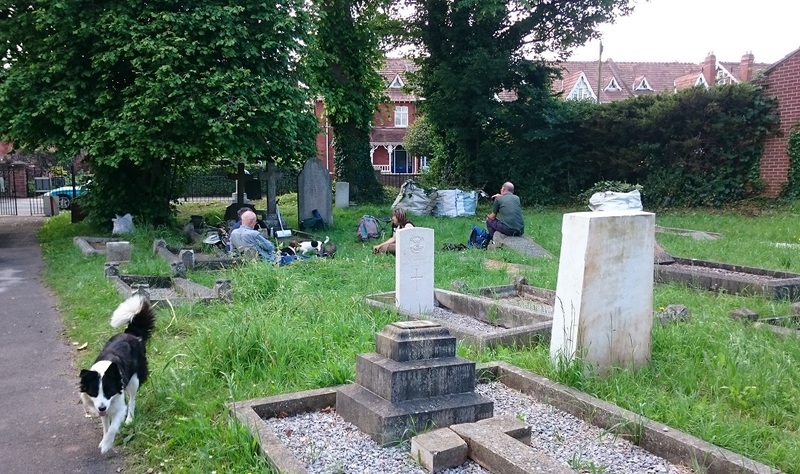 The lads then walked around the cemetery to identify which grave stones had been damaged by the SDC mower. It was soon established that there were quite a few. It was agreed that a day would be set aside for cementing back together kerbs and posts that had been hit and moved by the mower. There was sufficient cement brought today to repair two graves stones. Hole Sect.10 12 had one side and one end kerb stone that had been hit and moved by the mower. The headstone which was laid on the kerb stones had also been pushed to one side. The kerbs were cemented back in place and the headstone levered back into position. The Davey L22 grave which belongs to Pte Thomas W. A. Davey a casualty of the Korean war. This grave had been in poor condition but the kerb stones had recently been put back together with the headstone laid on top. Unfortunately, the mower had hit this grave knocking and dislodging the end kerb. The last of the cement mixed and the kerb cemented back into position. As it was 1o'clock it was agreed it was time they made their way home. Alan & Rita in the cemetery today. 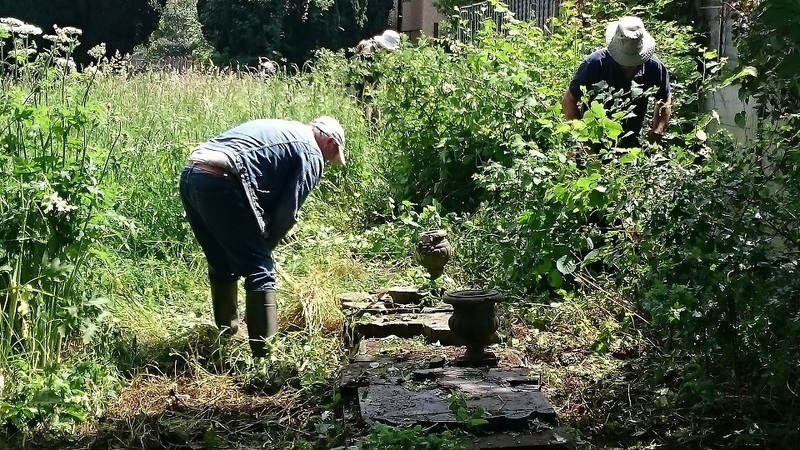 It was decided due to the heat, to pick up the remaining twigs and branches that Bill had cut back with his bush cutter, at the bottom end of the cemetery, when the Sedgemoor Conservationists were in on 3rd June. This done they cut back a number of branches on trees that were beginning to encroach area's where people walk, after filling 3 large dumpy bags they felt they needed a change. So..
Alan decided to repair the Browning M 15 kerbs and posts that had been knocked over, cementing them back together again. Rita concentrated on removing ivy from the Manchip M 23 and Ball M 22 memorial stones and started on the Sadler M 102 grave that was thick with ivy. This is a headstone laid flat between the high unmarked kerbstones. There is a tenon type piece on the bottom edge of the headstone that suggests it was once set upright in a base stone with a mortice. There is a need to check that the headstone belongs to the kerbs as this grave only has an oversite of concrete, no base stone. Well satisfied with their work they made their way home. A scorching Sunday, luckily Alan & Rita decided to get to the cemetery early, early start early finish to see England in the World Cup! Dave followed in a bit later. First we looked around Section B area as there are still a few graves that need sorting out as the photos on the website show, but these will have to wait for a bit. With the Cyril Ricks (G 44) event on 13 July, we thought we would check this area over so it looks in a respectable condition for the event. The loose grass was raked up from when the grass had been cut, so looking a little better now. The Jones G 62 grave nearby, was overgrown so this was weeded, the kerbs were in a bit of a state so the decision was made to sort this out. The three-tier block had tipped to the side a little so had to be packed and levelled to secure. The landing had broken and the whole grave was dipping to the centre, little could be done with that but it meant the kerbs could not sit level on the landing. One of the kerbs had been recently broken, most probably by the mower. Alan & Dave cemented a block in level so that the broken ends of the kerb could sit. The block needs to set before the kerb can be cemented back into position, this will be done on our next visit to the cemetery. Meanwhile Rita found herself in the shade of the nearby Elder tree and began cutting back the low branches which were touching the ground. She had made good progress but as the boys had finished their job they came over to help. Three large dumpy bags were filled with the branches and hauled over to the area where the debris is stored. Another days work accomplished. Weather forecast said today would be the hottest of the year 28 degrees! Alan and Andy in today to finish off the Jones grave started Sunday by Alan & Dave. The kerbs were quickly cemented back in place and stone chipping added, the pot and fallen cross laid back in the grave. They were well pleased with their effort and Andy took a photo. 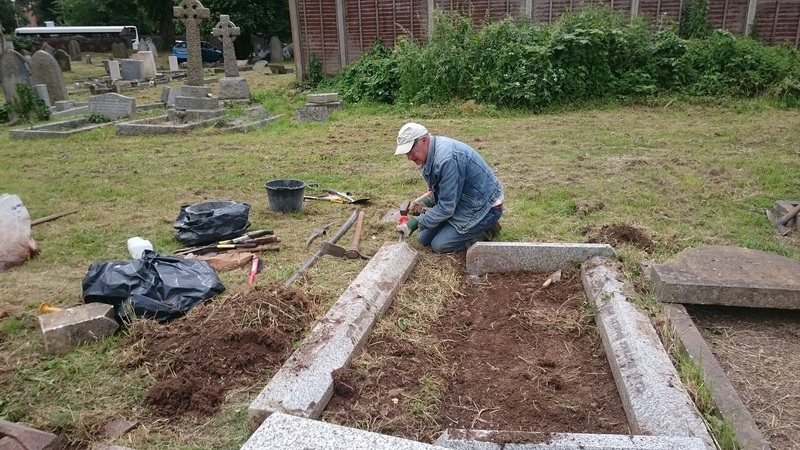 The Jones grave is in front of the Ricks G 44 grave so they raked up the remaining area of dried grass and Andy using his small battery strimmer tidied around the edges of the graves in the area, job finished. After a well-earned break they decided what could be done to the Bale N 18 and Came N 14 graves. The Bale grave was tackled first, the posts, side and end kerbs had been knocked out of position by the mower. The old cement holding the joints together were removed and the grave set cemented back together, another job done. The Came grave set made up of large red stone kerbs and posts, the kerb polished for the inscriptions. The kerbs and posts had been knocked apart and pieces broken off. One kerb had been broken and the centre base made up in crazy paving style had been pushed out of position. It would take a lot of cement and red sand to put this grave set back in some reasonable order. It was decided to chip off the old cement that had been holding the posts and kerbs together, and then try to line these up to their correct position or as near as possible. This was done and now ready for cementing back when next in. Sadly this is not the first time we have had to repair this grave.